Tobolsk prison castle was constructed by the Tsarist authorities at the turn of the 17th -18th century. The town of Tobolsk is in Siberia on the banks of the Irtysh. Both political and common law prisoners were sent there. Many Decembrists were sent to this white-walled prison from which no one has escaped, and many died and were buried there. With the Revolution the Bolsheviks , instead of destroying this symbol and instrument of Tsarist authority, took it over for their own use. The Tsar and his family were imprisoned there for awhile, to be followed by many who had themselves worked for his overthrow. Socialists of all descriptions were confined there. 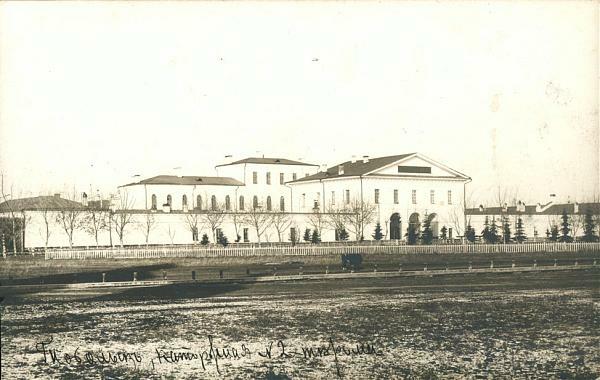 Tobolsk prison witnessed a hunger strike against bad treatment in 1926 and anarchists continued to be sent there in the 1920s and 1930s. However the worst was yet to come. A great wave of executions of opponents of the regime began in 1937 and 1938 claiming many lives. Troikas (three person commissions) set up by the security police dished out summary death sentences which were quickly enacted in a few days. On August 12th 1937, one hundred and forty four socialists of different currents were executed at Tobolsk. These included the SRs Evgeny Kolosov and Valentina Kolosova and at least eighteen anarchists. The most well-known of the anarchists murdered on that day was Aron Baron, about which there is much information. Ivan Budarin was another. Born in 1897 he belonged to a group of underground anarcho-syndicalist workers in Petrograd in the early 1920s. he was first arrested in 1926, and continued to face spells of prison and exile. Another was Yuri-Izgodin-KoKhomentovsky , born in 1905. He became an anarchist in 1919 and worked in the Poltava group of the Nabat Confederation of Anarchists. In 1923 he was sent to the Solovski prison and was then exiled to Siberia, where he was re-united with his wife Ekaterina Ilinichna Izgodina-Khomentovsky. She also was shot on that day. Yet another victim was Alexander Pastukhov born on 21st November 1897. A mathematician, he became an anarchist individualist in 1915. In spring 1918 he joined the Communist Party and held government and party positions in the Balakhinsky district of Nizhny-Novgorod province. He fought in the Civil War against the Whites. Late in 1918 he resigned from the Party and became secretary of the Nizhny-Novgorod Anarchist Federation. He was arrested in 1919 and again in 1921 and in 1923 on suspicion of underground anarchist activity. In this period he worked as a research assistant and a lecturer at the Physics and Mathematics Faculty of Moscow State University. He was known as an anarchist theorist and publicist. He served as chair of the anarchist section of the All –Russian Public Committee for the Commemoration of P.A. Kropotkin. He worked in the underground anarchist groups and for awhile worked with the anarcho-mystics in the Kropotkin Committee but soon found this impossible and severed relations with them. He had evolved his positions to become a staunch defender of the Organisational Platform of Arshinov, Makhno et al. He participated in the creation of the underground Union of Anarchist Workers in 1929 and was arrested for his involvement with this in 1930. He served three years in a political-isolator and was then sent into exile in Siberia. Another anarchist slain on that day was Vladimir Sergeivich Khudolei, who used the pseudonym Gradin. Born in 1890, he joined an anarchist circle at Moscow Commercial Institute, along with a dozen others. After examined the various anarchist currents, they rejected individualism and in 1913 named themselves the Moscow Anarchist Communist Group. They established contact with anarchists in New York and Western Europe and spread anarchist propaganda in the Moscow factories and in neighbouring towns. Khudolei continued work in the underground up until the February Revolution and was then a leading light in the Moscow Federation of Anarchist Groups and the Lefertovo District Organisation of Anarchist Communists. At the end of 1918 he was a member of the secretariat of the All-Russian Federation of Anarchist-Communists up until 1925. In 1929 he joined an underground anarchist group with Nikolai Rogdaev, Vladimir Barmash and Alexei Borovoi, which enthusiastically supported the Organisational Platform. He was arrested three times from 1929 onwards, and served five years in a political-isolator and three years in exile. Ivan A. Shabalin born in 1888 was first a Socialist-Revolutionary evolving to be a Left SR in 1917. In 1919 he moved over to an anarchist communist position. From the beginning of 1919 he was subjected to arrest after arrest, prison and exile, yet refused to be deterred from underground activity in Petrograd, Nizhny-Novgorod, and Siberia. Other veterans of the anarchist underground who were slaughtered on that day were Procop Evdokimovich Budak born 1889, Zinaida A. Budakova born 1894, Nikolai Alexandrovich Desyatkov, Andrey Leonidovich Zolotarev, born 1901, Anna Aronovna Sangorodetskaya, born 1894, Michael G. Tvelnev born 1879 and Naum Aaronovitch Eppelbaum born 1884. Along with these were shot young students of the local college Abram Isakovitch Venetsky, Ivan Golovchansky, Vsevolod G. Denisov and the peasant Andrew P. Kislitcin born 1873, who had attended meetings of the exiled anarchists. The bodies were buried in a common grave in the farmyard section of the prison. In total 2,500 people were shot at Tobolsk in 1937-38. It's perhaps worth noting that A. V. Dubovik, the Ukrainian historian who has done so much of this research, refuses to mention dates of "rehabilitation" in his biographies on the grounds that "it changes nothing and adds nothing to the study of their lives and the epoch in which they lived". "Rehabilitation" (as opposed to "amnesty") implies that the accused were unreasonably accused and convicted. In the case of the anarchists mentioned above, they were mostly sentenced under Article 58 ("counter-revolutionary" activities), which included "any action aimed at overthrowing, undermining or weakening of the power of the governments of the USSR". In contrast to other left-wing opponents of the Soviet regime, the anarchists mostly did not deny their interest in overthrowing the government, and were murdered by the state in accordance with prevailing judicial norms. Therefore the concept of "rehabilitation", as applied to the anarchists, is not only irrelevant, but demeaning. Good point. Will never the sentence.